Let’s get it out there: it’s almost prom are you’re, like, really excited. 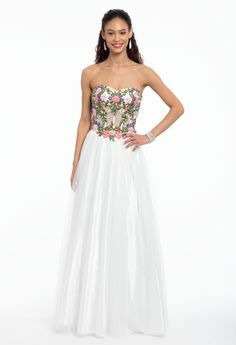 But since the formal dance is a once (or maybe twice) in a lifetime experience, there’s a certain level of stress that creeps in when it’s time to go shopping, namely trying to match your prom dress with the perfect accessories. After all, how easy is it tell if the encrusted beading on your dress is the same as the clutch you eyed in the mall…without having said dress with you (answer: kinda impossibly overwhelming) Luckily, we did some of the work for you by pairing some dazzling styles with chic heels and handbags that complement. Scroll below for our prom dress + accessory combos. This blue prom dress is the perfect blend of timeless and trendy; a sleek silhouette with a fashion-forward cutout neckline. Accent it with metallic heels and a stone clutch. Who said pink can’t be chic? Well they clearly haven’t seen this sequin prom dress! Elevate it with rhinestone heels and a matching satin clutch to complete this super-feminine look. This pretty pastel was THE color last year, and isn’t going anywhere just yet. Glide through the night in this delicate off the shoulder prom dress; a gold clutch and heels add a chic contrast. Own your look (and the night) in this sophisticated silver style boasting gorgeous embroidery, an illusion neckline, and a tiered skirt. A navy clutch amps up the elegance while silver heels make for an effortless finish. The modern way to wear florals? Pretty 3-D detailing! Add a yellow backdrop (already trending for Spring ’19) and you’re good to grow. Bring out the warm tones further with a metallic rhinestone clutch and sparkling gold heels. Next up, check out the prom dresses we predict our celeb style icons would wear. « Which Prom Dress Would Your Style Icon Wear?